St Ignatius Church was constructed on a commanding site at the summit of Richmond Hill in Church Street, Richmond. Designed by architect, William W. Wardell, the cathedral-like church was built in stages between 1867 and 1894, with the spire added in 1927-8 by architect, Gerald W. Vanheems. The adjacent presbytery, designed by Thomas A. Kelly, was built in 1872; the school/parish hall to the rear, designed by Gerald A. Vanheems, was built in 1911; and numerous ecclesiastical buildings are contained within the surrounding precinct, west of Church Street. Due to the rapidly increasing Catholic population in Melbourne in the 1860s, the Irish Province of the Society of Jesus were encouraged to send members to Victoria. Irish Jesuit, Joseph Dalton, on his arrival in 1866, accepted a position at Richmond, and was subsequently instrumental in selecting and acquiring the 1.5 acre site on Richmond Hill, and constructing the church of St Ignatius. 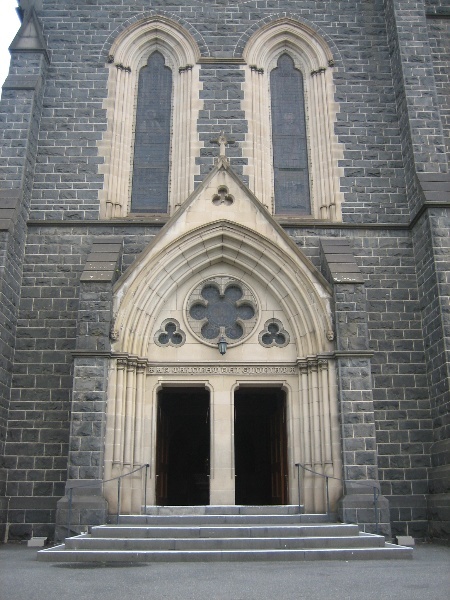 The prominent architect, Wardell, who was already involved in the design and construction of St Patrick's Cathedral, East Melbourne, was employed to design the large parish church, and the foundation stone was laid the following year by Dr John Polding, the first Archbishop of Sydney. The first stage of St Ignatius church, comprising the nave, aisles and part of the tower, was opened in 1870. Designed by Wardell, the supervising architect was John B. Denny who was brought from England by Wardell for this purpose. Transepts were added c.1883 by Wardell and Vernon, and the chancel and apsidal chapels were completed in 1894. Designed in the Gothic Revival style, St Ignatius church was described at its opening in 1870 as Early Thirteenth Century French Gothic. It is an asymmetrical, cruciform church which, on completion in 1894, comprised a nave; aisles; transepts; apsidal sanctuary with ambulatory; four chapels, three of which are apsidal; and a clerestory to the nave, transepts and sanctuary. The lady chapel was placed on the north side of the church and a baptistery at the base of the tower at the north east corner. The church is built of coursed axed bluestone with freestone dressings, and has a slate roof with gablets. External decoration is plain with single and multiple lancet window openings and simple geometric Gothic window tracery in the wheel window of the front facade and the transept windows. Internally bluestone columns support the nave and transept arcading, while those supporting the sanctuary arcade are of red granite. The nave roof is of exposed timber trusses with timber lining boards, and that of the sanctuary and the lady chapel are of panelled wood. The spire, added in 1927-8, is taller and thinner than originally planned and the tower base is also taller, however much of the detail appears similar to that proposed by Wardell. An organ, designed and built by local organ builder, George Fincham, was installed in a gallery at St Ignatius in 1876. It was originally built in 1874 and installed in the Melbourne exhibition building for the Colonial Exhibition of 1875. The organ was moved to the end of the Lady Chapel in 1897 and was relocated to its existing position, south of the altar, in 1989. From the late nineteenth century, stained glass has been incorporated in the church building, with a concentration in the apse chapels at the west end, installed in the early twentieth century. Decoration of the sanctuary was undertaken in 1914, the marble high altar completed in 1924 and the lady chapel altar in 1925, both by Hallett of Richmond. The Presbytery was built to the south of the church in 1872 as a two storey house, possibly of brick, with a double storey, cast iron verandah. At some stage after 1897 the verandah was replaced with a bluestone arcade and balcony, and a large two storey polygonal bay was added at the south east corner. The two prominent facades, to the east and north, are now of coursed random bluestone with freestone dressings. 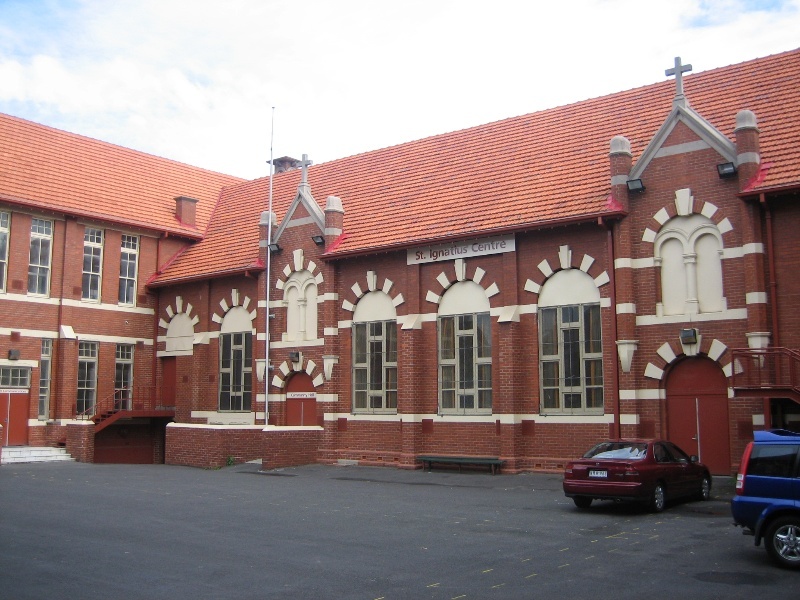 The two storey, red brick school/parish hall building, designed in a Romanesque style, has rendered dressings, a red tile roof and iron balconies and escape stairs. It was constructed to the west of the church in 1911, replacing an earlier school building constructed on the same site in 1876. It was built for the Jesuit fathers, with the sisters from the Faithful Companions of Jesus responsible for the education of the girls. Designed in an H-form, it initially provided accommodation for primary school boys and girls in separate wings, connected by a large parish hall. The latter was originally built with a proscenium, stage, balcony, openable roof and sliding doors to enable the expansion of the hall to accommodate a thousand people. The building was described on opening as 'the most complete and scientifically finished educational buildings in the Commonwealth', with ventilation, light and dust minimisation carefully considered in the design. Richmond was perhaps the mostly strongly Irish working class suburb in Melbourne in the nineteenth and the first half of the twentieth century,with links to labour politics. After the post-war influx of southern and eastern European migrants, many of them Catholic, the Catholic parish continued to be an important social centre for the community. St Ignatius Church, School and Hall are associated with the Society of Jesus, founded by Ignatius Loyola as a religious order in the Catholic Church. The church signifies the commencement of the Jesuit Order in Victoria. It was an early religious foundation in Victoria and Irish Jesuit traditions influenced Australian Catholicism from the second half of the nineteenth century. 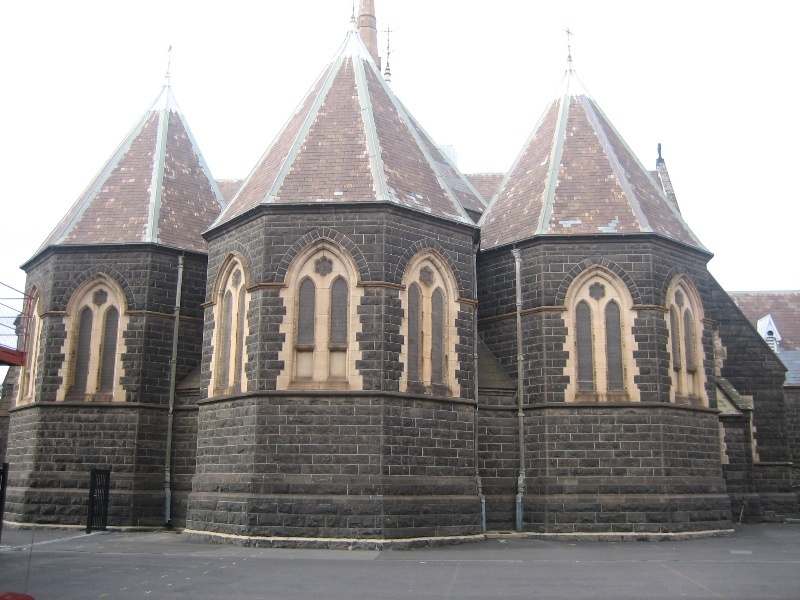 St Ignatius Church, Richmond is of architectural, aesthetic and historical significance to the State of Victoria. 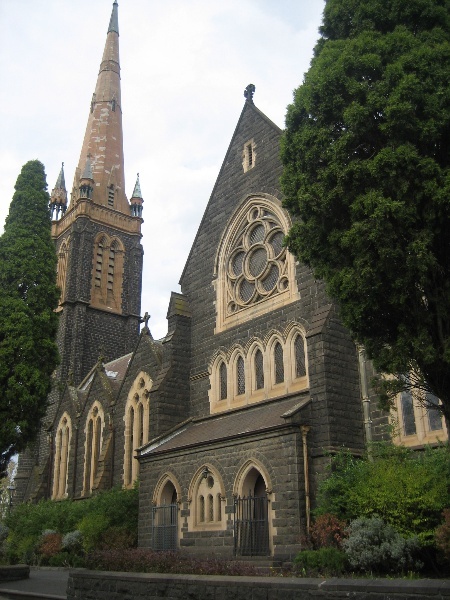 St Ignatius Church, Richmond is of architectural significance as an important example of the ecclesiastical work of the architect, William Wardell, who became renowned for his Gothic Revival work in Australia. It is the largest church designed by Wardell and exhibits his typically competent conservatism with simplicity of line and plainness of decoration. 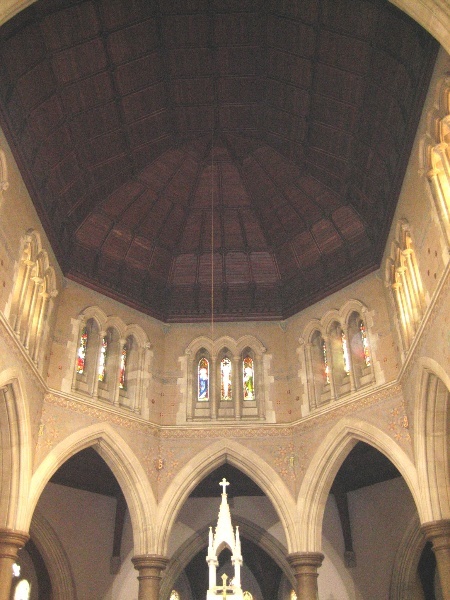 On its completion in 1894 it was claimed to be the third largest Roman Catholic Church in Australia. It is significant as a major ecclesiastical landmark in Richmond. Conspicuously sited in an impressive manner, it is the dominant element in an important and cohesive precinct with a range of ecclesiastical buildings. St Ignatius Churchis of aesthetic significance for the quality of its fittings and decorative elements, including stained glass and the marble high altar. 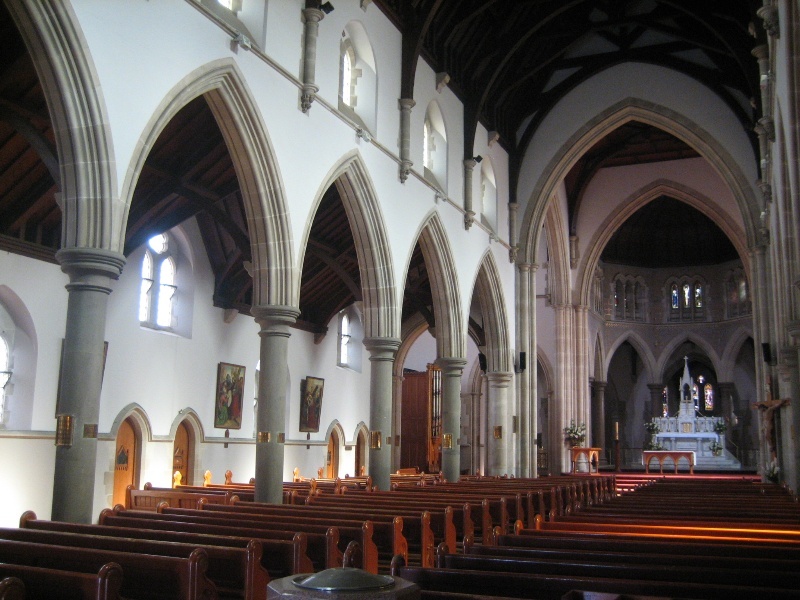 St Ignatius Church is of historical significance for its associations with the members of the Society of Jesus, at first all drawn from Ireland, whose traditions and ideas have influenced Australian Catholicism from the second half of the nineteenth century. St Ignatius Church is of historical significance for its association with the history of the Catholic Church in Victoria. Its size reflects the growth of the Catholic population of both Richmond and Victoria from the 1850s and 1860s and the increasing influence of Catholics in Australian political and social life. 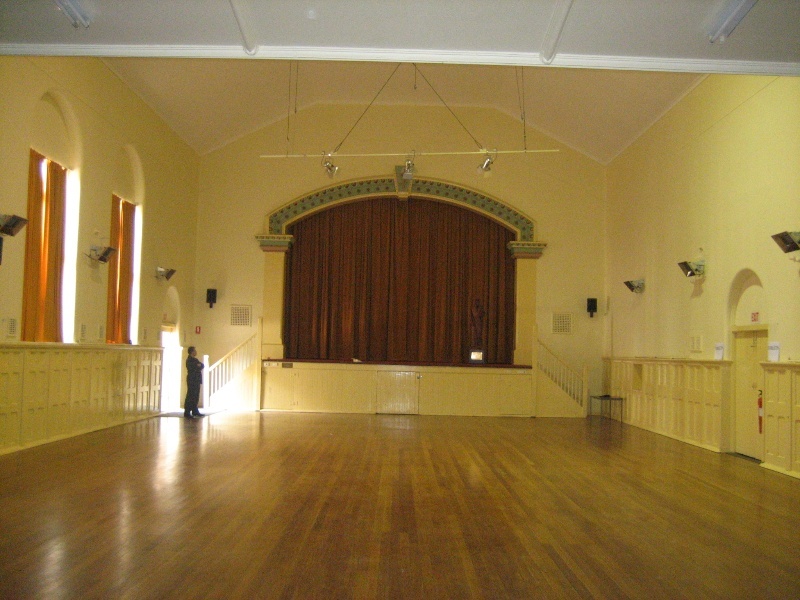 The parish hall and school reflect the aspirations of the mainly Irish working class for their children's education while the hall provided a centre for meetings for religious, social welfare and political activities. St Ignatius Church is of historical significance for the associated buildings on the site, the presbytery and the school/parish hall. The school and hall were used for the educational and social activities sponsored by the Jesuit fathers to assist their parishioners. At the time of opening the large, school/parish hall building was considered as amongst the most impressive buildings for Catholic education in the country. 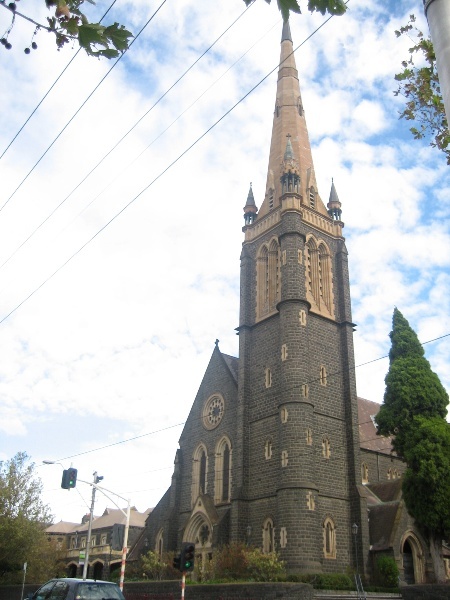 St Ignatius Church is of historical significance for its organ, which was built by renowned organ builder, George Fincham, the most prominent Melbourne organ builder in the late 19th century. This is one of the most intact examples of Fincham's early work and the casework is especially notable, with three corbelled towers and lightly diapered spotted metal pipes. 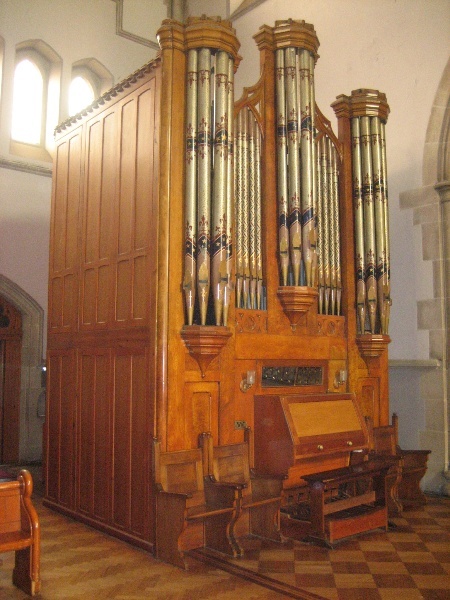 It is the only exhibition organ from the 19th century to survive largely unaltered, and appears to be the prototype of the second period of Fincham's organs. 1. All of the buildings marked as follows on Diagram 2146 held by the Executive Director. 2. All of the land marked as L1 on Diagram 2146 held by the Executive Director being all of the land described in Certificates of Title Volume 2513 Folio 558, Volume 2513 Folio 559 and Volume 2671 Folio 189. St Ignatius Church was constructed on a commanding site at the summit of Richmond Hill in Church Street, Richmond. Designed by architect, William Wardell, the cathedral-like church was built in stages between 1867 and 1894, with the spire added in 1927-8 by architect, Gerald W. Vanheems. 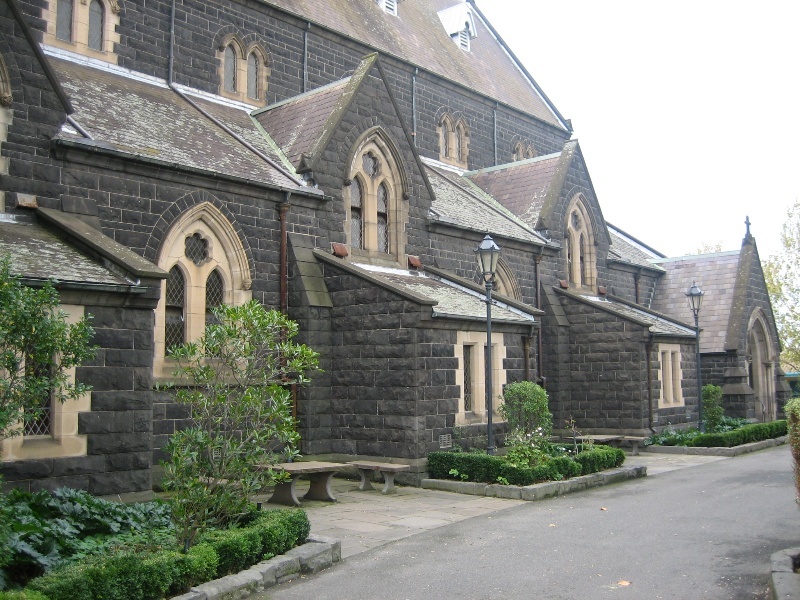 The adjacent presbytery, designed by Thomas A. Kelly, was built in 1872; the school/parish hall to the rear, designed by Gerald A. Vanheems, was built in 1911; and numerous ecclesiastical buildings, both associated and other, are contained in the surrounding precinct, west of Church Street. 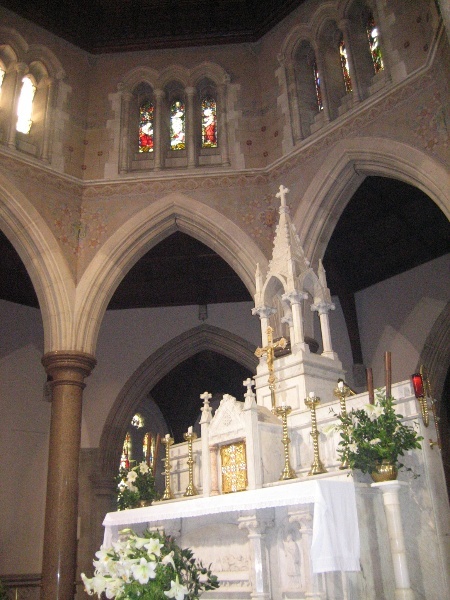 Due to the rapidly increasing Catholic population in Melbourne in the 1860s, and the subsequent shortage of priests, the Irish Province of the Society of Jesus were encouraged by the first Bishop of Melbourne, James Goold, to send members to Victoria. 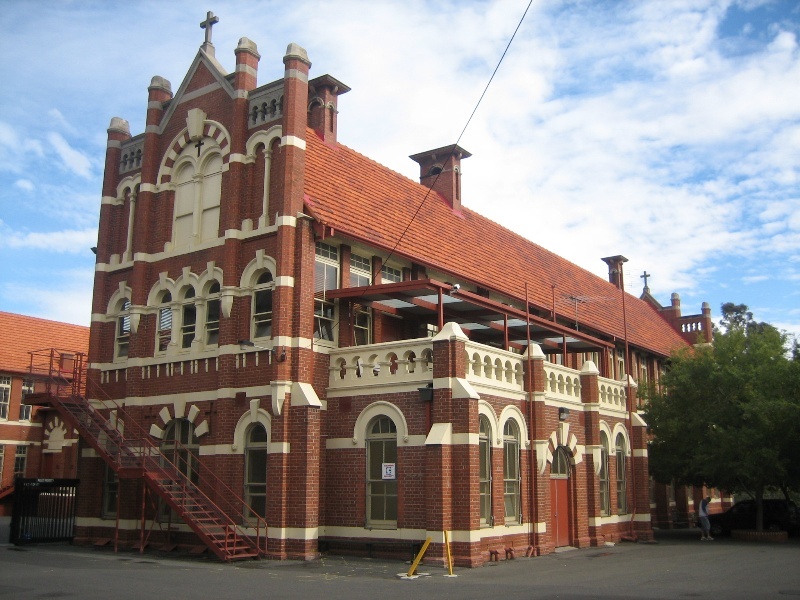 The Jesuits were offered St Patrick's College and the mission of Richmond, which was a large parish extending, at that time, east to Hawthorn, Kew and Nunawading. Irish Jesuit, Joseph Dalton, on his arrival in 1866, accepted a position at Richmond, and was subsequently instrumental in selecting and acquiring the 1.5 acre site on Richmond Hill, and constructing the church of St Ignatius. 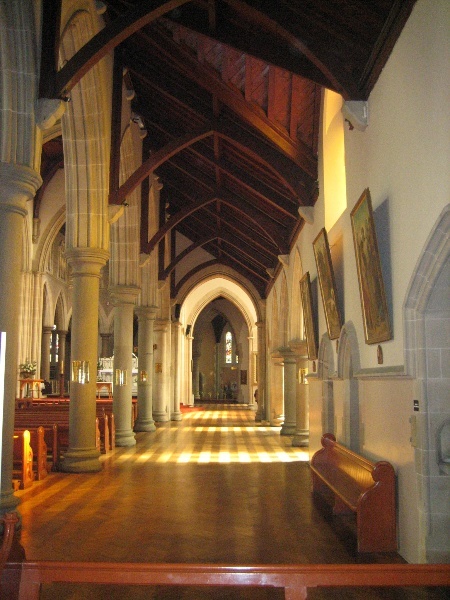 Wardell, who was already involved in the design and construction of St Patrick's Cathedral (from 1860), was employed to design the large parish church, and the foundation stone was laid the following year by Dr John Polding, the first Archbishop of Sydney. William Wilkinson Wardell arrived in Melbourne in 1858, having established a successful practice in London where he worked for fourteen years. During this time he saw the development of the Gothic Revival as a major style in England and made the acquaintance of renowned Gothic Revival architect, A.W. N. Pugin. Wardell's conversion to Roman Catholicism enabled him to establish himself as a prominent architect for this religion by the mid-1850s. He continued this after his arrival in Melbourne, where he designed the Cathedral and fourteen parish churches, the largest of which was St Ignatius. Wardell spent twenty years in Melbourne, combining private practice with working for the Public Works Department, initially as Clerk of Works and Chief Architect, and from 1861 as Inspector General of Public Works. 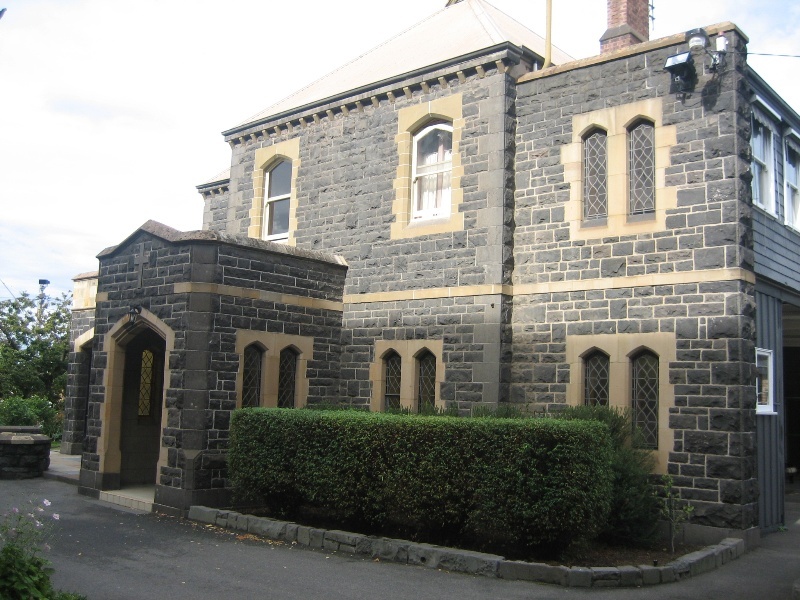 His private practice flourished in the 1860s with the design of churches in Melbourne and Sydney. The controversial sacking of Wardell and others from the P. W. D. in 1878, saw Wardell relocate to Sydney and establish a practice there. He went into partnership with W. L. Vernon in 1884 and in the 1890s practised with his son Herbert. 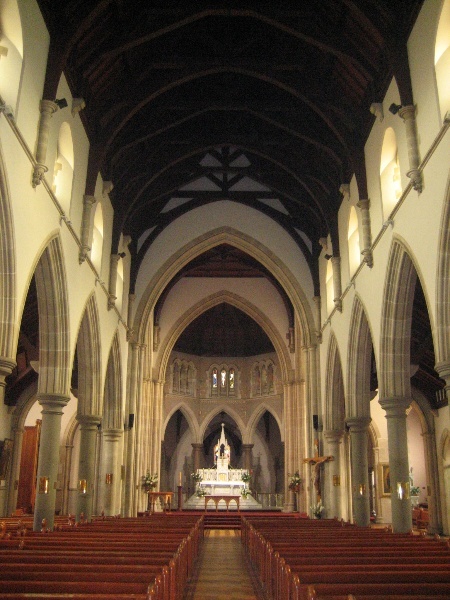 The first stage of St Ignatius church, comprising the nave, aisles and part of the tower, was opened in 1870. Designed by Wardell, the supervising architect was John B. Denny who Wardell brought from England for this purpose. The increased Catholic population in the area in the 1880s put pressure on the existing building and this resulted in the completion of the planned church. Transepts were added c.1883 by Wardell and Vernon, and the chancel and apsidal chapels were completed in 1894. Designed in the Gothic Revival style, St Ignatius church was described at its opening in 1870 as Early 13th century French Gothic. It is an asymmetrical, cruciform church which, on completion in 1894, comprised a nave; aisles; transepts; apsidal sanctuary with ambulatory; four chapels, three of which are apsidal; and a clerestorey to the nave, transepts and sanctuary. The lady chapel was placed on the north side of the church and a baptistery at the base of the tower at the north east corner. The church is built of coursed axed bluestone with freestone dressings, and has a slate roof with gablets. External decoration is plain with single and multiple lancet window openings and simple geometric Gothic window tracery in the wheel window of the front facade and the transept windows. Internally bluestone columns support the nave and transept arcading, while those supporting the sanctuary arcade are of red granite. The nave roof is of exposed timber trusses with timber lining boards, and that of the sanctuary and the lady chapel are of panelled wood. The spire, added in 1927-8, is taller and thinner than originally planned. The tower base was also heightened, however much of the detail appears similar to that proposed by Wardell. An organ, designed and built by local organ builder, George Fincham, was installed in a gallery at St Ignatius in 1876. It was originally built in 1874 and installed in the Melbourne Exhibition Buildings for the Colonial Exhibition of 1875. The organ was moved to the end of the Lady Chapel in 1897 and was relocated to its existing position, south of the altar, in 1989. From the late 19th century, stained glass has been incorporated in the church building, with a concentration in the apse chapels at the west end, installed in the early 20th century. Decoration of the sanctuary was undertaken in 1914, the marble high altar completed in 1924 and the lady chapel altar in 1925, both by Hallett of Richmond. A number of internal alterations were made after Vatican II in the 1980s. The Presbytery was built to the south of the church in 1872 as a two storey house, possibly of brick, with a double storey, cast iron verandah. 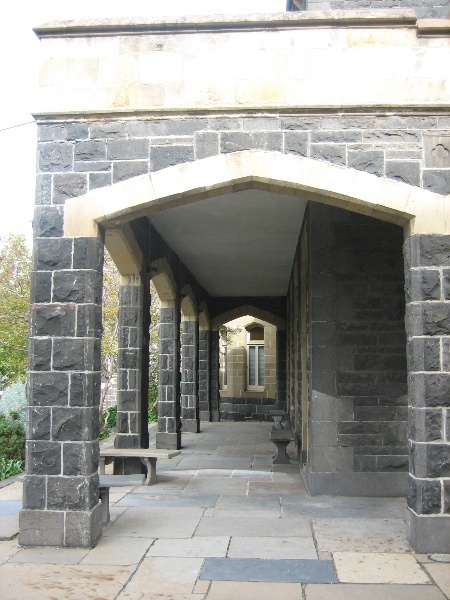 At some stage after 1897 the verandah was replaced with a bluestone arcade and balcony, and a large two storey polygonal bay was added to the south east corner. The two prominent facades, to the east and north, are now of coursed random bluestone with freestone dressings. The two storey, red brick school/parish hall building, designed in a Romanesque style, has rendered dressings, a red tile roof and iron balconies and escape stairs. It was constructed to the west of the church in 1911, replacing an earlier school building constructed on the same site in 1876. It was built for the Jesuit fathers, with the sisters from the Faithful Companions of Jesus responsible for the education of the girls. Designed in an H-form, it initially provided accommodation for primary aged boys and girls in separate wings, connected by a large parish hall. The latter was originally built with a proscenium, stage, balcony, openable roof and sliding doors to enable the expansion of the hall to accommodate 1000 people. The building was described on opening as 'the most complete and scientifically finished educational buildings in the Commonwealth', with ventilation, light and dust minimisation carefully considered in the design. The Lentaigne triptych, date of origin unknown, is thought to have been brought from Ireland by the first two Irish Jesuits, Joseph Lentaigne and William Kelly, who arrived in Melbourne in 1865. It is thought to have been in the Richmond parish since this time. After preliminary assessment of the triptych in 1997 by the Fine Arts Department at Melbourne University, and further assessment by the National Gallery of Victoria and Melbourne University, restoration was undertaken by the Australian National Gallery, Canberra in 2000. Its present location has not been determined. Designed by William Wardell, the church was built in stages between 1867 and 1894. The spire was added in 1927-8. The site also contains a presbytery built in 1872 and a school built in 1911. Should it become apparent during further inspection or the carrying out of works that original or previously hidden or inaccessible details of the place or object are revealed which relate to the significance of the place or object, then the exemption covering such works shall cease and Heritage Victoria shall be notified as soon as possible. 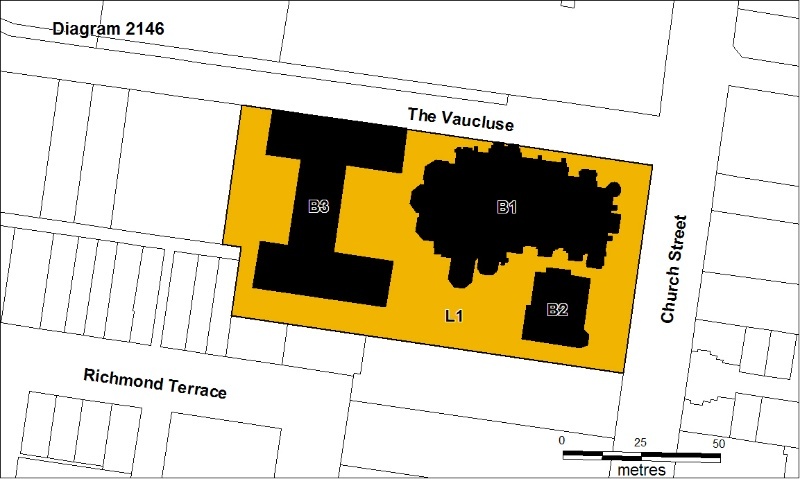 Note: All archaeological places have the potential to contain significant sub-surface artefacts and other remains. In most cases it will be necessary to obtain approval from the Executive Director, Heritage Victoria before the undertaking any works that have a significant sub-surface component. If there is a conservation policy and plan endorsed by the Executive Director, all works shall be in accordance with it. 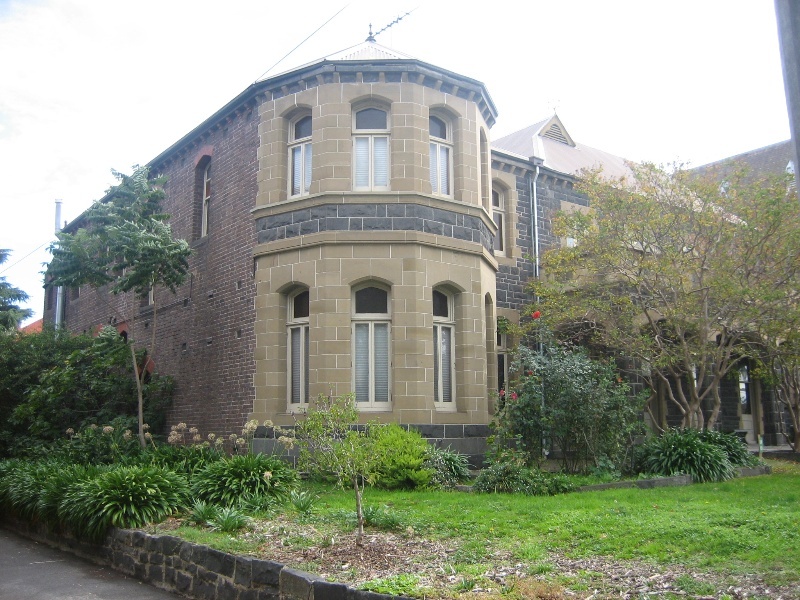 Note: The existence of a Conservation Management Plan or a Heritage Action Plan endorsed by the Executive Director, Heritage Victoria provides guidance for the management of the heritage values associated with the site. It may not be necessary to obtain a heritage permit for certain works specified in the management plan. Nothing in this determination prevents the Executive Director from amending or rescinding all or any of the permit exemptions. e) the replacement of existing services such as cabling, plumbing, wiring and fire services that uses existing routes, conduits or voids, and does not involve damage to or the removal of significant fabric. Note: Surface patina which has developed on the fabric may be an important part of the item's significance and if so needs to be preserved during maintenance and cleaning. Note: The development of signage and site interpretation products must be consistent in the use of format, text, logos, themes and other display materials. Note: Where possible, the signage and interpretation material should be consistent with other schemes developed on similar or associated sites. It may be necessary to consult with land managers and other stakeholders concerning existing schemes and strategies for signage and site interpretation. Demolition or removal of non-original stud/partition walls, suspended ceilings or non-original wall linings (including plasterboard, laminate and Masonite), bathroom partitions and tiling, sanitary fixtures and fittings, kitchen wall tiling and equipment, lights, built-in cupboards, cubicle partitions, computer and office fitouts and the like. Removal or replacement of non-original door and window furniture including, hinges, locks, knob sets and sash lifts. All works including demolition and internal modification to buildings not included in the extent of registration are permit exempt. Additions to building not included on the extent will require either the approval of the Executive Director or a permit. * Removal of suspended ceilings from the school wings of the school building. * Minor internal works that do not affect the structure or the plan layout of the Presbytery or the School building. The purpose of a Permit Exemption is to allow works that will not impact on the significance of the heritage place to occur without the need for a permit. Works other than those mentioned in the permit exemptions may be possible but will require permit approval or the written approval of the Executive Director. The purpose of the Permit Policy is as a guide to assist when considering, or making decisions, regarding works to the place. It is recommended that any proposed works be discussed with an officer of Heritage Victoria before they are undertaken or a permit is applied for. The significance of St Ignatius Church is focussed on the William Wardell's design for the building and Gerald Vanheems design for the spire. Any proposal that would alter these aspects of the place should be avoided. The internal decoration of the of the place is restrained and the subtle decoration around the sanctuary is of particular note. Any proposals to alter the tone of the internal decorative scheme should be avoided. However repainting as part of maintenance is possible but only with permit approval or the with the written approval of the Executive Director. Internally, the Presbytery is unembellished but has been partially altered. An extension of an enclosed sleep out has been added to rear. Minor internal works that do not affect the structure or the plan layout are permit exempt. Proposed works that may alter the internal layout of the place are possible but only where they will not adversely affect the understanding of the place and only with permit approval or with the written approval of the Executive Director. Alterationsto the enclosed sleep out may be possible with permit approval but any works other that maintenance to the front and sides of the building should be avoided. A later set of stairs has been installed in the Presbytery to access the first floor. The construction of the stairwell required the removal of a wall of a ground floor room. This stair case can be removed and the room reinstated but will require permit approval to ensure that the works do not adversely affect the significant fabric of the place. The stair case can be replaced but will also require permit approval. Removal of early or original fittings and fixtures in the Presbytery should be avoided and will require permit approval or the written approval of the Executive Director. Such items include, but are not limited to fire place surrounds, bell pulls and buttons, door and window hardware and joinery. Internally, the School building is unembellished but has been partially altered. Except for works in the Hall, minor internal works that do not affect the structure or the plan layout are permit exempt. The internal layout of the place reflects its use as a school. Minor internal works are possible without requiring permit approval except where they adversely affect the understanding of the place, the Hall and its backstage area, the remaining fire places and the doors into the Hall. Suspended ceilings have been installed in the two school room wings. These can be removed without permit approval but permit approval or the written approval of the Executive Director may be required for any remediation works to the original fabric of the place. Works that would alter the Hall and its backstage area should be avoided, particularly where they may adversely affect the fabric of the place or change the use or understanding of the place. One of the sliding doors into the Hall has been set in place as a result of later works. These later works can be removed to allow the door to open but will require permit approval or the written approval of the Executive Director to ensure that no significant fabric is adversely affected by the works. A number of later additions have been added to the rear of the school building. These can be removed with permit approval or with the written approval of the Executive Director.